Tate Adams was born at Holywood, Northern Ireland. In 1942 during his war service, he taught himself wood engraving using home made tools on boxwood blocks. Transferred to Ceylon in 1943, he visited temple ruins with a Buddhist priest and artist friend Manjusiro Thero, to draw; Adams also illustrated an army newspaper. Manjusiro introduced him to the work of Japanese printmaker Munakata whom he was to meet on a number of occasions in Japan, before Munakata's death in 1975. In 1949 Adams returned to London where he studied wood engraving under Gertrude Hermes at the Central School of Arts. In 1951 he emigrated to Australia; the following year he enrolled in evening printmaking classes at RMIT, where he developed his printing skills with lithographer and printer Lionel Harrington. He began to exhibit in international print biennales in 1954 with the 'First international colour woodcut exhibition' (1954-56 tour of UK, Europe, USA) and in 1956 finished a Diploma in Illustration specialising in book production at RMIT, which he saw as a necessary precursor to establishing his own press. In 1957 he went to London, then Dublin where he worked for Dolmen Press, which published his book 'The soul cages'; this signalled the beginning of his involvement with limited edition books. He returned to Melbourne in 1959 and taught briefly at Caulfield Technical College and an evening printmaking class at RMIT. In 1960 he established Australia's first Diploma of Printmaking course at RMIT and forged links with artists who wanted to make prints using the facilities there, such as Fred Williams, Leonard French and George Baldessin. In 1963 he organized an exhibition 'Forty two prints by seven artists' which toured nationally, and opened the Crossley Gallery, Melbourne in 1966, devoted to showing prints. The inaugural exhibition included the work of Japanese as well as Australian contemporary artists. By 1968 he had turned his attention away from his own wood engravings, colour linocuts and lithographs, to focus on the development of artist's books. With George Baldessin he established Lyre Bird Press in 1977, the first in Australia to produce high quality books in the tradition of the French livre d'artiste; he moved the press to Townsville in 1989, where he also became associated with the Art School of the James Cook University. 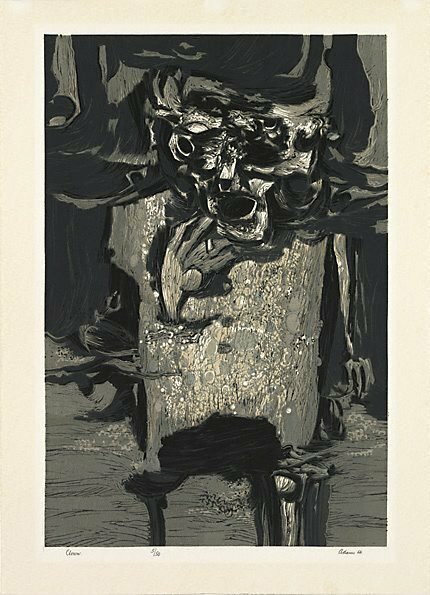 'Clown' was printed by the artist from five blocks at the RMIT workshop; it was exhibited in the Gallery's national touring exhibition 'Australian Print Survey' of 1963-64. Signed and dated l.r., pencil "Adams 62".